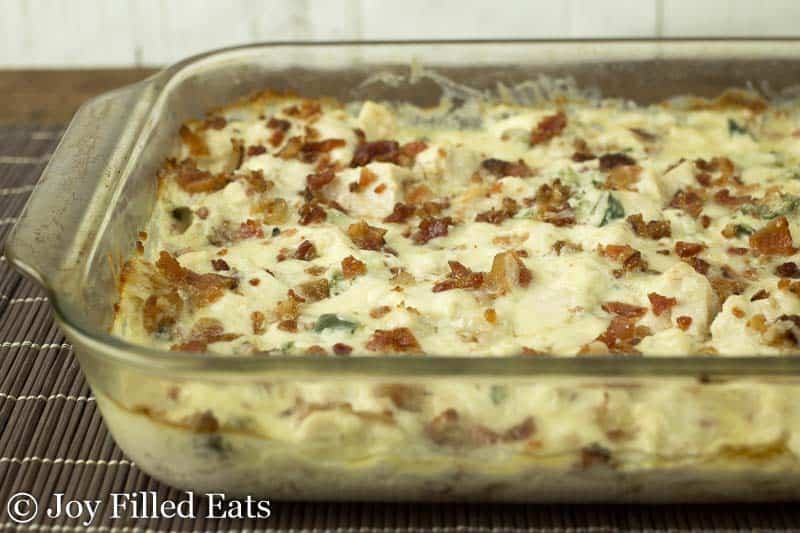 Chicken in a creamy cheesy sauce with pieces of jalapeno and loads of bacon. 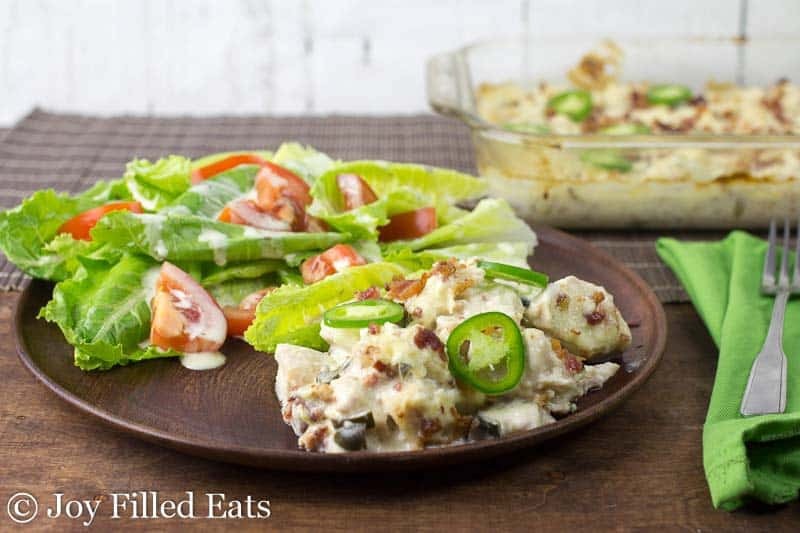 This Jalapeno Popper Chicken Casserole is one of the best casseroles ever. Yeah. They were supposed to be baked on top of the casserole. But I really wanted to share this with you today. And my kids really wanted dinner at the usual time. So it got topped with raw jalapenos. Que Sera, Sera. I can hear my grandmother singing it in my head whenever I think of that song. You can just stop here and eat that creamy mixture with a spoon if you want. Or use it as a dip. It is awesome just as is. 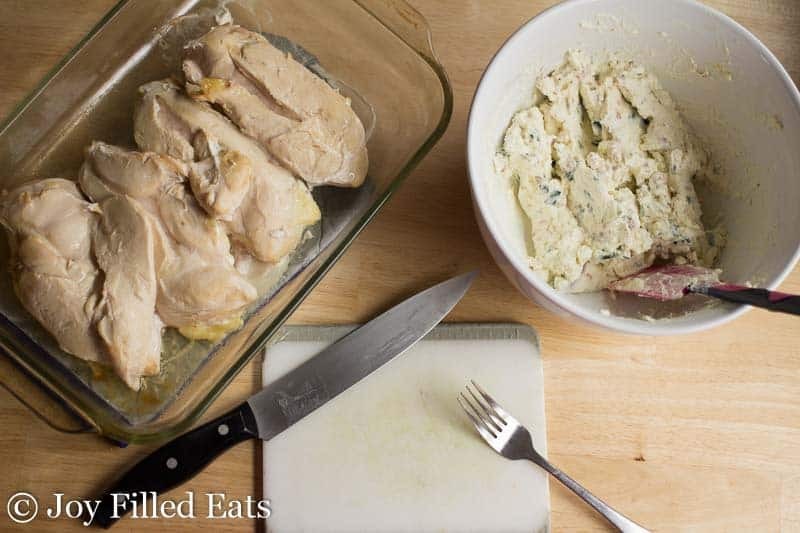 To cook the chicken for this I put it in a 9 x 13 casserole dish, cover it with foil, and bake at 350 for about 45 minutes until it is 160 degrees on a meat thermometer. These were huge chicken breasts. You may need to adjust the time depending on the size of your chicken. I like to serve this with a green salad but any non-starchy vegetable will work as a side dish. 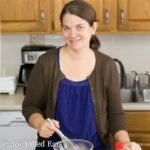 If you enjoy a little kick to your food (and you probably do since you are looking at a jalapeno recipe after all) make sure to try my friend Sarah’s Buffalo Chicken Casserole over at My Montana Kitchen! Combine the first 8 casserole ingredients in a large bowl. Mix until smooth. Add the cooked chicken. Put into a greased casserole dish. Top with the reserved cheddar, bacon, and sliced jalapenos (if using). Bake at 350 for 35 minutes or until bubbly and hot. Serve with a side salad. OMG! Just Freakin' awesome!!! I was afraid of so much jalapeno so I cooked most of them separately ... they go quite mild when cooked, I just poured them all over the top when done. Such a flavour profile!! Very Satisfying, you don't need much, even tho you have to stop yourself from eating more!! lol. I used frozen chicken breasts and they turned out so juicy & tender!! & used the same dish. Do you think I can use jalapeños form a jar? Yes, canned jalapenos should work. Has anyone tried this in a slow cooker with raw chicken? I've done some of my other casseroles in the crock pot. I just cook the chicken, cut or shred it, drain the excess liquid, and then add it back to the crock pot with the other ingredients until they are hot and the cheese is melted. Just putting it all in at once makes the sauce too watery. Yum! This looks divine. 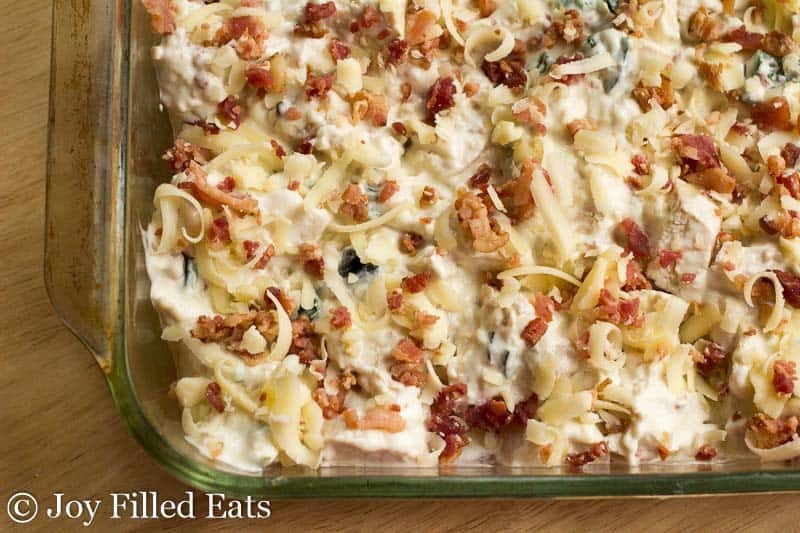 I love a good casserole dish and I love this kick that this one has! This one is going on my next meal plan! 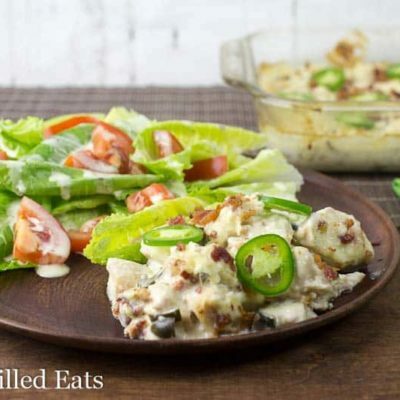 I've added this wonderful to my list of favorite low carb recipes. 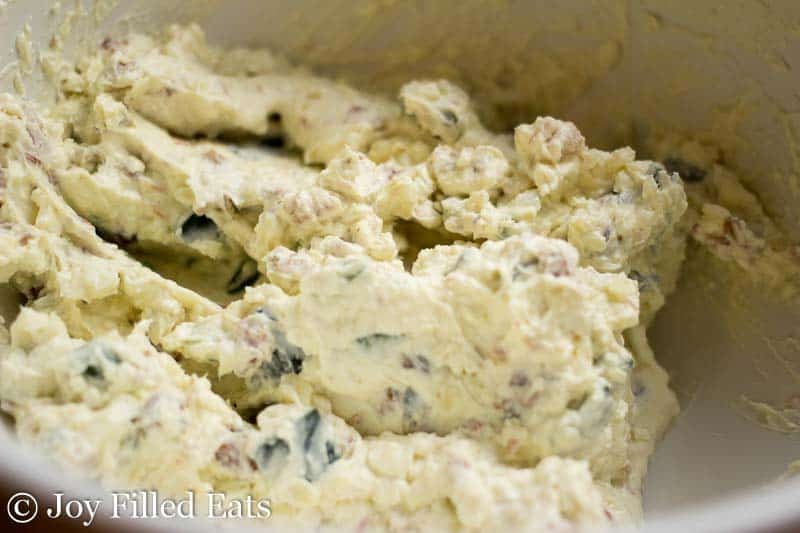 The flavors are incredible and yes, I did eat the creamy mixture with a spoon, it's heavenly! Tastes great. Love it. How many serving are in this dish? Or how much is one serving? Hi Lisa, the nutrition is for 1/8th of the casserole. I'm glad you liked it! This may be a crazy question but this looks so good so I gotta ask... Is this very spicy or does the jalapeno just give it a little kick? I wanna try it but don't care much for spicy food.. I haven't made this one (something similar) but I am going to, looks yummy. If you clean your jalapenos well, remove seeds and the membrane things they are not hot and just give it a nice flavor. 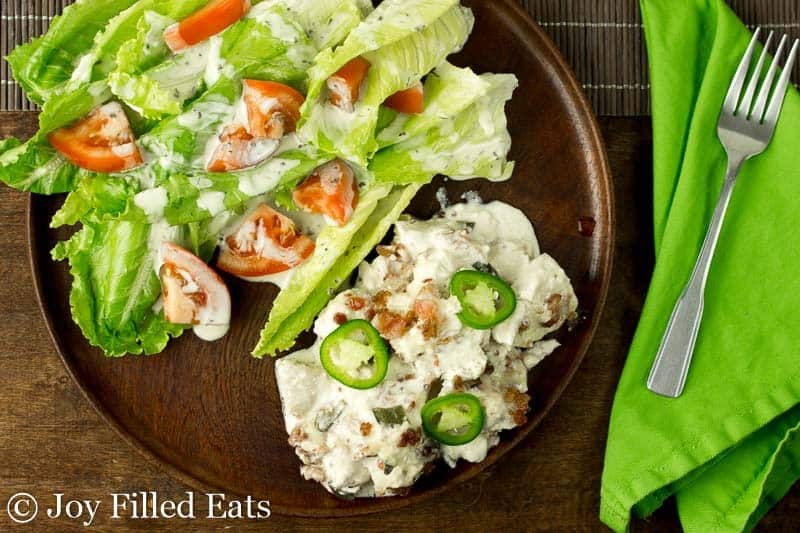 Of course I like spicy but my husband does not but he eats it with lots of jalapenos on the chicken and likes it. Every now and then I might get one bite of something hot but once cooked the peppers are pretty mild. Just a kick however it can be made spicier for those that like it that way!! My kids don't like spicy food sometimes so this time I subbed canned green Chile's and they loved it! I have added up the nutrients and calories several times and I come up with way more than you per serving. I am on Keto, I just made this and I can't eat it because it's way too many calories for so little food. am I doing something wrong? It looks and smells delicious but I can not afford all those calories. sorry. Hi Bernadette, this is rich and creamy so yes it has a lot of calories. Cheese and bacon are delicious but higher in calories than many other foods. I serve this alongside a big green salad, broccoli, or cauliflower. You can even mix in a vegetable to bulk it up without increasing the calories. Or you could cut the amounts of cheese in half. Also, I double checked my nutrition facts in two other places and this repeatedly comes out to about 400 calories a serving. I'm not sure what the discrepancy is. It says 417 calories per serving. Yes. That is "about 400". Depending on which brands of cream cheese, cheese, etc you use the calories might vary a bit. Nutrition calculators also can have small differences. Could this be made in a pressure cooker, to cook chicken with all other ingredients? I don't think so. You could cook the chicken first, drain the liquid, and then add it back with the other ingredients to melt the cheese. I think if you put everything in at once it would be soupy. Of course you can serve raw jalapenos. That's the best way next to roasted imo. Does this recipe freeze well? I wanted to portion it out as I'm a single person then I could just pull it out of the freezer as needed, thanks! I can't wait to try this tonight ? I have not tried freezing this one yet. I have frozen my chicken caesar casserole after baking it before. This recipe is on my to do list along with many other of your recipes! Thanks for sharing! I would love to have supper at your house for a week! ? Have you tried substituting the mayo with anything? You could use more sour cream or plain Greek yogurt if you don't want to use mayo. what size pan did you cook this in? Made this for dinner last night. It was great and we enjoyed it even more warmed up today after flavors blended. Will go into my permanent lo-carb file! Thanks!! Am I overlooking the oven temp? I just realized that too...it's in the blog part, but not on the actual printed recipe! 350 for 35 minutes. I hear my grandma singing it too! I want to try this. This looks so delicious! My husband and I both will love it! My husband will love this. It's going on the menu for next week!